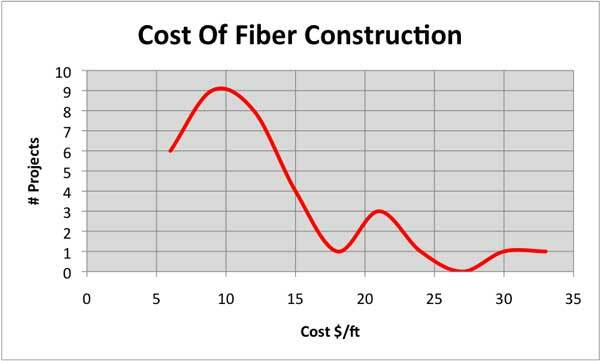 How Much does Fiber Construction Cost? FOA Has Another Record Year in 2015! 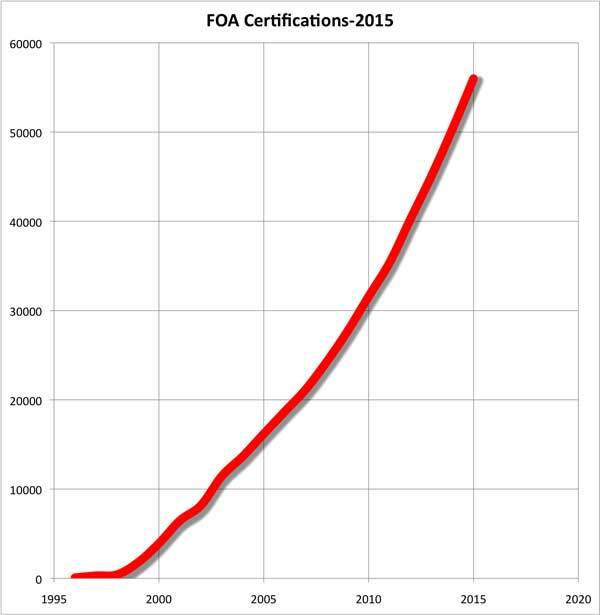 FOA continued its record growth in 2015, certifying 5603 new members and ending the year with almost 57,000 certified technicians on our rolls. 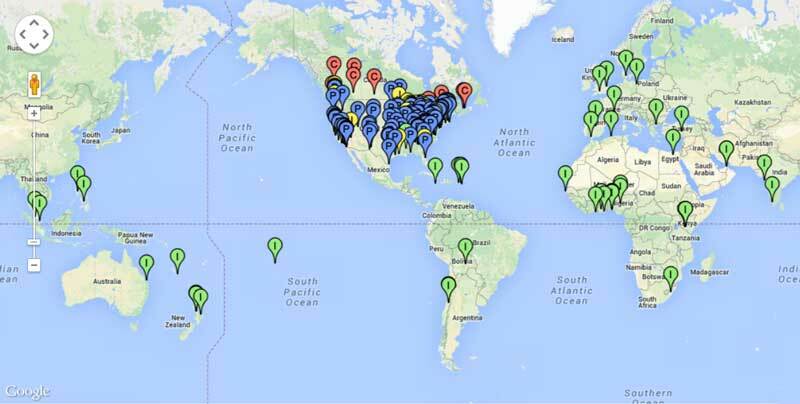 Our schools (now ~200 active schools in ~40 countries) contributed most of the new certificants, but a number came to us through the FOA "Work-to-Cert" program that allows techs with field experience to take the FOA certification exams directly. 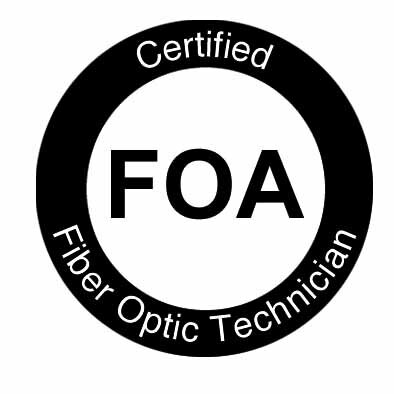 FOA's Work-to-Cert program has proven popular with FOA Corporate Members who use it to get their experienced techs FOA-certified directly. More and more CFOTs and CPCTs are taking specialist courses too. 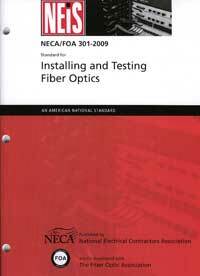 CFOS/O (OSP installation) has become as popular as CFOS/S (splicing) and CFOS/T (testing) in the skills certifications. 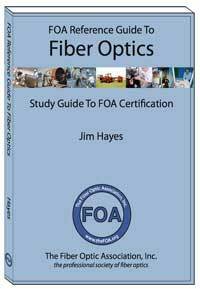 In the application certifications, CFOS/H (FTTH) remains the leader but the others (DAS, FTTA, OLAN and Data Center) are gaining in popularity. 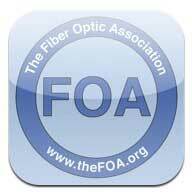 FOA's free online training website, Fiber U, has expanded to include online self-study courses in almost every area of fiber optics and has added a "Certificate of Completion" program to allow those who finish the courses to gain recognition for their work. Many employers recognize work done online, but of course it's knowledge only. 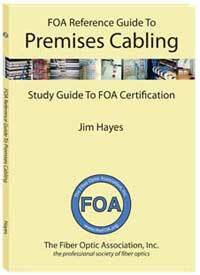 While it's preparation for FOA certifications, you also need field experience or hands-on training. 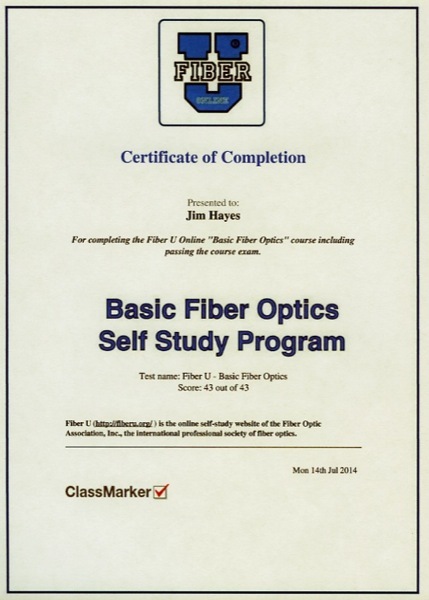 Fiber U is great preparation for taking a FOA certification course at one of our schools, ensuring you will be well-prepared for the courses they give. It’s always good to review the past year each year (“Those who cannot remember the past are condemned to repeat it.” quoting George Santayana) and think about what the near future may bring in case that helps us cope with the changes we'll face or perhaps even influence them. We have several fast growing applications today: data centers, fiber to the antenna (FTTA), distributed antenna systems (DAS), but the biggest impact is likely to from “grassroots fiber to the home.” While the big FTTH guys likee Google are grabbing all the low-hanging fruit of high-density urban areas like Atlanta (and maybe even LA) and ignoring the rural customers (just like telephone companies have been doing for a century), some locals around the world have been adopting a grassroots, do-it-yourself attitude and building their own. 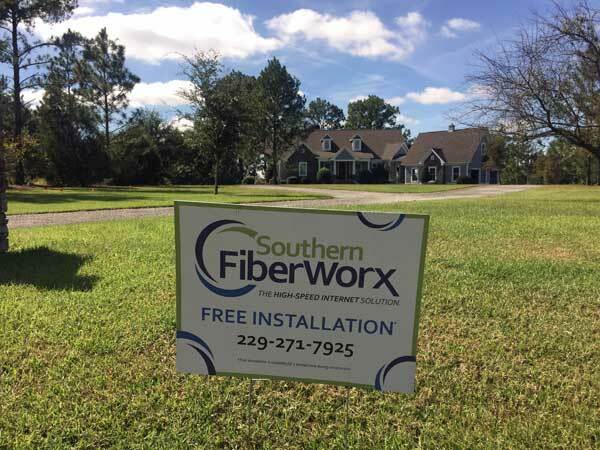 The best example is Southern Fiberworx of Cordele, GA, USA. FOA NL Nov. Right behind the FTTH market are DAS (distirbuted antenna systems) especially in large sports facilities like the SF 49ers Levi Stadium in the SF Bay Area. When Super Bowl 50 arrives at the stadium in a few weeks, the crowd's wireless needs will be handled by another complex DAS system made possible with fiber. 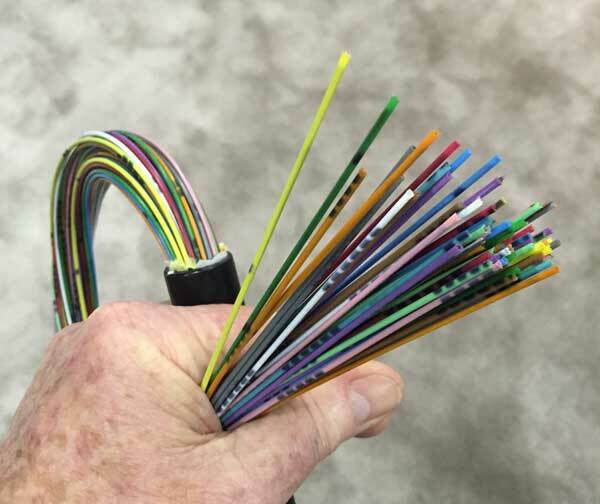 Passive Optical LANs (OLANs) continue to gain traction in the IT market, especially in the military/government market, but also hospitality and education. One incentive for the military base at Ft. Campbell, KY, to chose a passive OLAN was an initial savings of $1.5million over installing a traditional structured cabling LAN. Fort Campbell was also able to reduce its cabling, floor, rack and closet requirements by almost 90%. 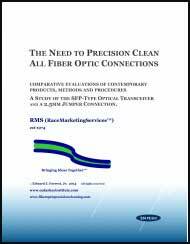 The best new multimode technology was wideband multimode fiber (WBMMF) and the CWDM transceivers that allow 100G over two fibers. Prompted by Cisco’s 40G solution using WDM, the industry responded quickly to standardize on this no-brainer and expand it to 4x25G for 100G. 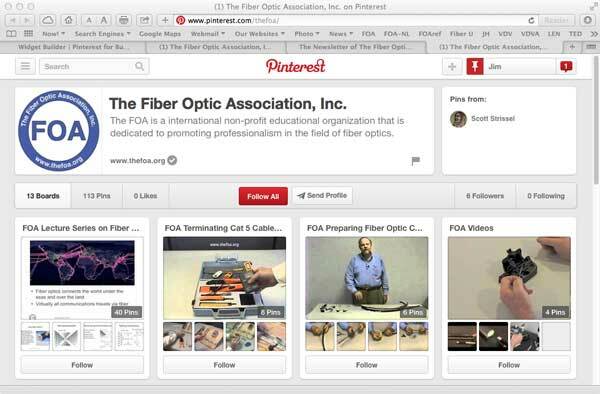 Users not happy with the zillions of fibers needed for parallel optics welcomed this solution which may well expand the life of MMF for another decade. Of course, it still has to compete against SMF which has become the dominant fiber is large-scale data centers. 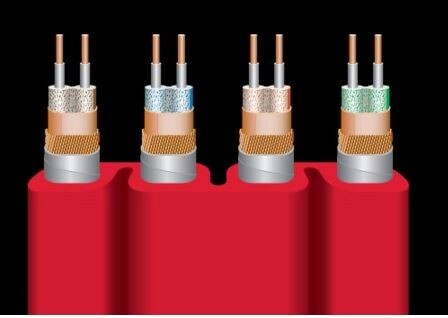 The best new cable technology is the high-density cables created using a combination of bend-insensitive fiber and smaller fiber coatings. 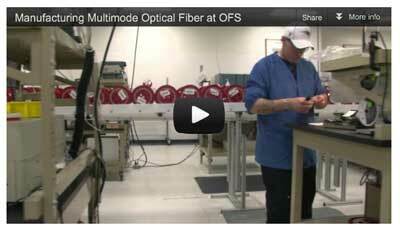 Now you can get 1728 fibers into a cable less than 25mm (1”) diameter. 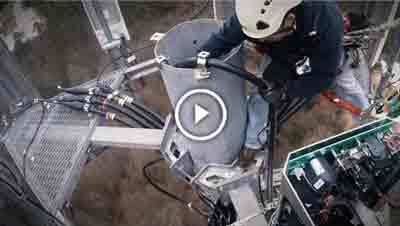 These are great solutions for dense urban FTTH as well as giant data centers. 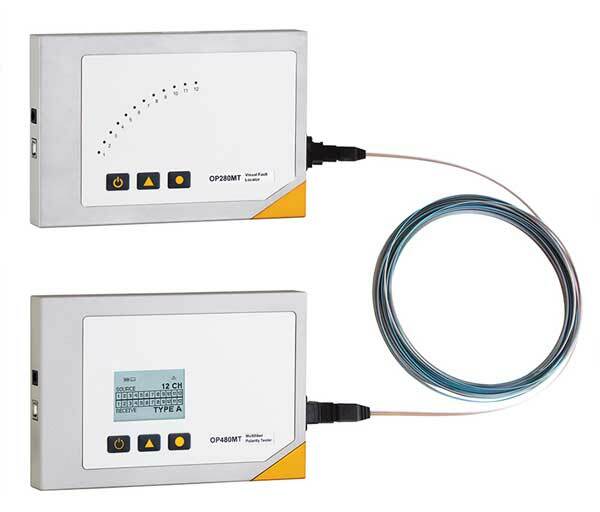 The 16 fiber MPO connector may be something users don't want or need. 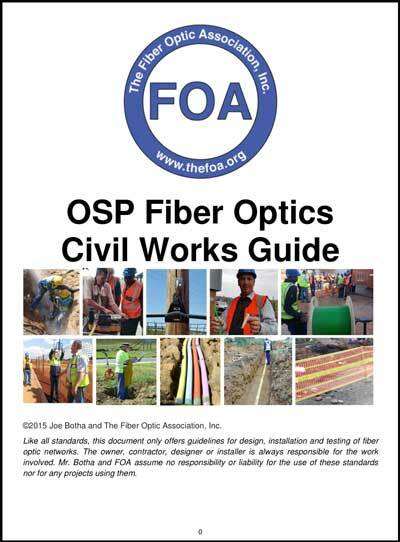 As if many users were not unhappy enough with the 12 fiber MPO, we now have a standard for a 16 fiber MPO. 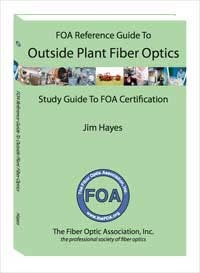 Since the current TIA 568 standard has more than 20 pages of information on 12 fiber MPO systems trying to explain array connector polarity, we can expect the 16 fiber MPO to more than double that in the future. 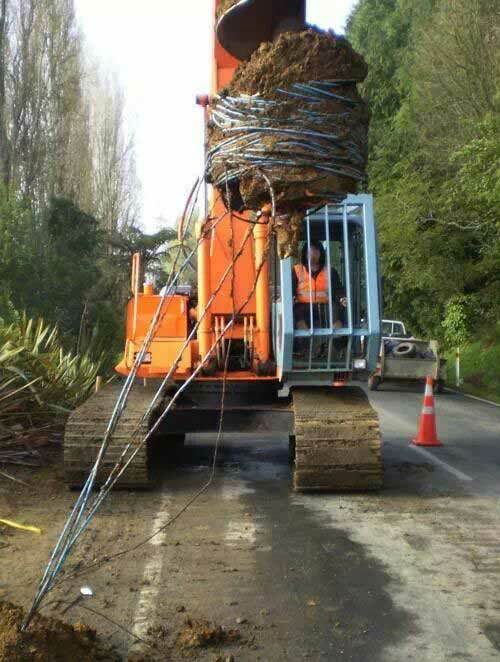 Then again, perhaps it will prove to be a useful addition to the prefab cable market. If you are confused by MPOs, try watching the FOA videos on them where we try to explain their quirks. The work continues on Cat 8, sucking up vast resources on a technology that is past its prime but devotees are unwilling to admit is close to extinction. Everybody thought the standard was ready to publish but the Ethernet committee decided to add a 50G system. We understand the Cat 8 people decided to hold off to see if they needed even more performance - it would have been embarassing to release Cat 8 and have to come back immediately for Cat 8A! 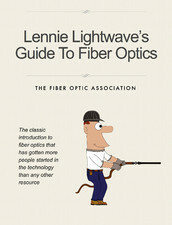 We never like to make forecasts of the future - they're aways wrong - but we expect to see lots more fiber! 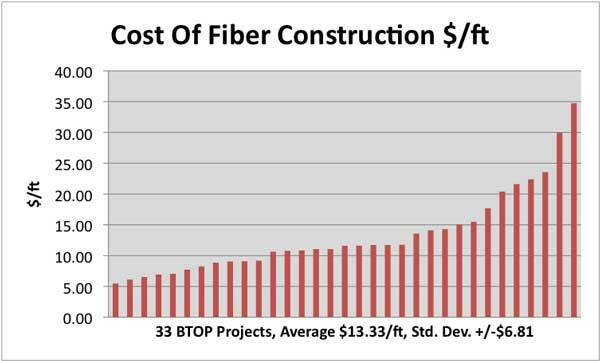 It's hard to get a handle on fiber construction costs because every job is unique and few projects reveal the actual costs. One interesting piece of data surfaced recently from the BTOP program, the US broadband incentive program from the early days of the last recession. We analyzed the data and produced these two graphs. Here is a simple graph of the 33 jobs reported, lined up by cost. Remember most of these are rural projects or in urban areas that lack broadband because of, generally, economic reasons. As you can see, the costs range from just over $5/foot to about $35/ft. What we wanted to show was the distribution of costs, so we did another analysis by frequency of cost and got this graph. Now you can see the cost distribution better. The average might have been $13/ft, but most of the jobs were close to $10/ft. There is another peak at just over $20/ft and a small one at $30, probably some jobs with more difficult construction challenges. like urban or mountainous areas. 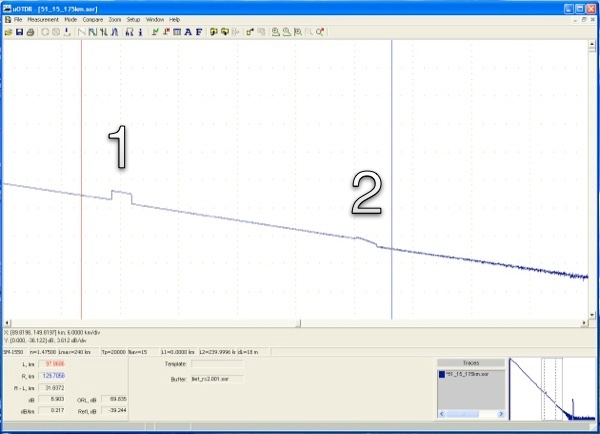 If you want to analyze this data yourself, here is the BTOP data and a spreadsheet we used to analyze it in a ZIP file. 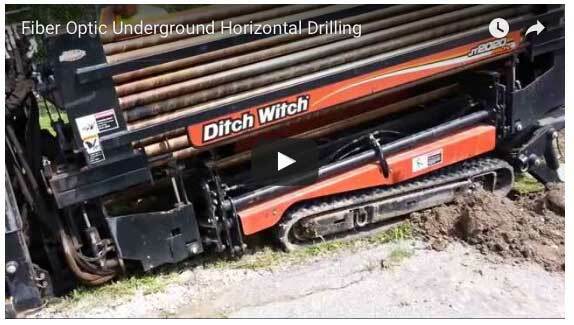 Fiber tracing and visual fault location quickly became a standard tool of the field tech. 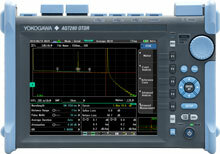 It was almost always paired with an OTDR since it worked close to the tech in the OTDR "dead zone." 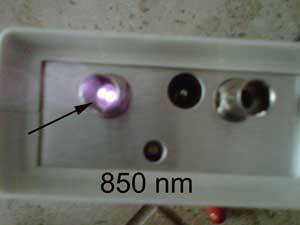 It was 1991 before diode lasers at visual wavelength (~635nm) with sufficient power for a VFL became available. 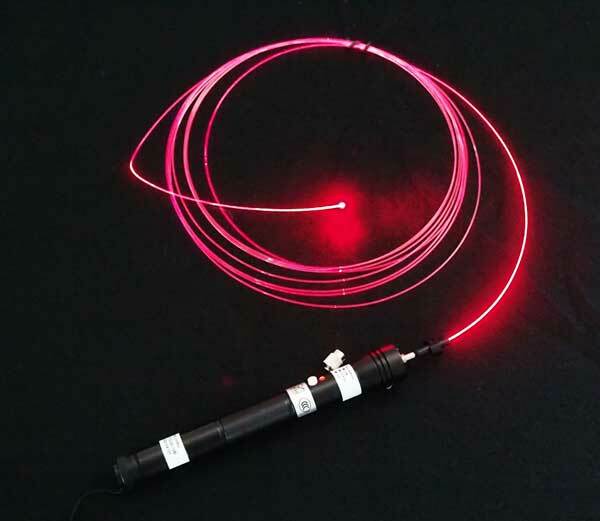 As soon as FOTEC could get them made with fiber pigtails, it introduced the next generation of VFLs in the same case as other laser test sources. 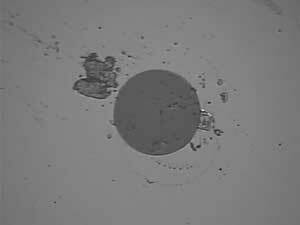 Eventually, the product was miniaturized by mounting the visible diode laser in a active device mount and attaching that to the end of a flashlight, creating the flashlight-sized product we are familiar with today. 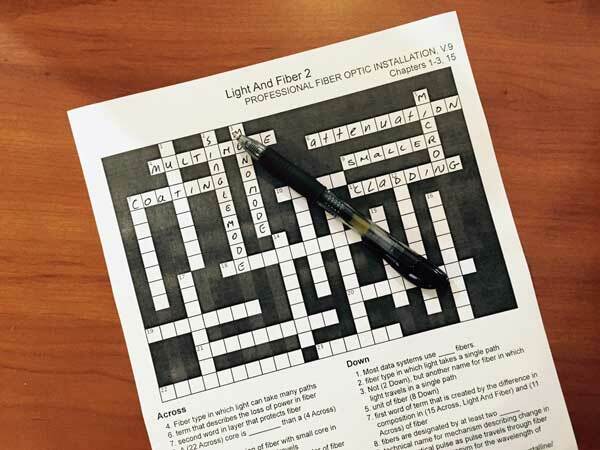 For premises fiber where multimode was the norm, a "flashlight test" was common, checking continuity and tracing fibers to get the right connections. 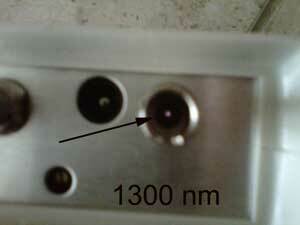 The problem was aligning the fiber with the flashlight bulb. FOTEC responded with a product for that application too. 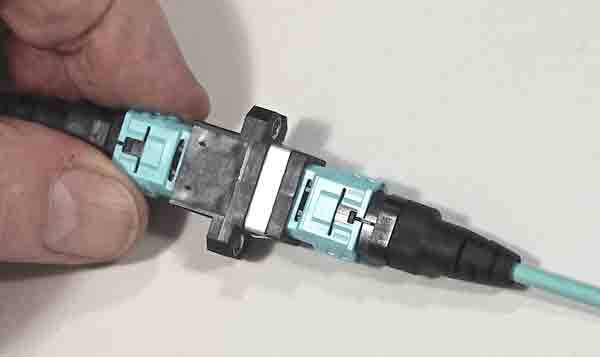 The FOTEC solution was a small flashlight with a fiber optic connector adapter, the same adapter that was used on the company's power meters. 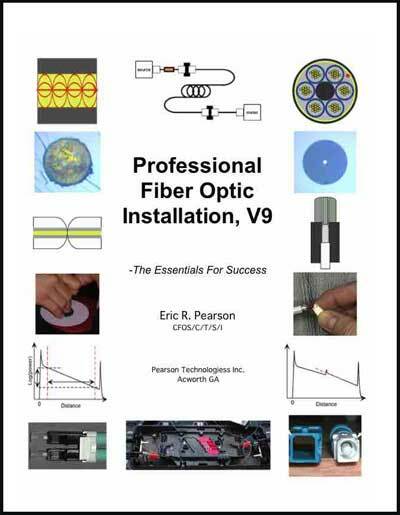 This was a great solution and FOTEC started including them in their fiber optic toolkits. 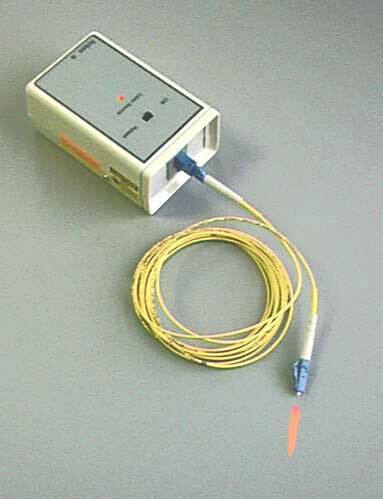 The problem with this fiber tracer was it was expensive. 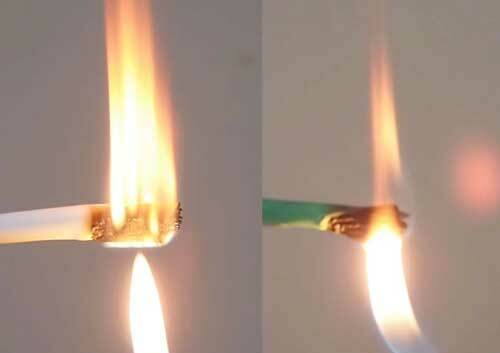 A less expensive solution was developed using a pocket-sized Mag-Lite Solitaire flashlight and a molded plastic adapter for 2.5mm ferrules that fit ST, SC, FC and FDDI connectors. FOTEC called this the "FOtracer" and it sold for only $29! 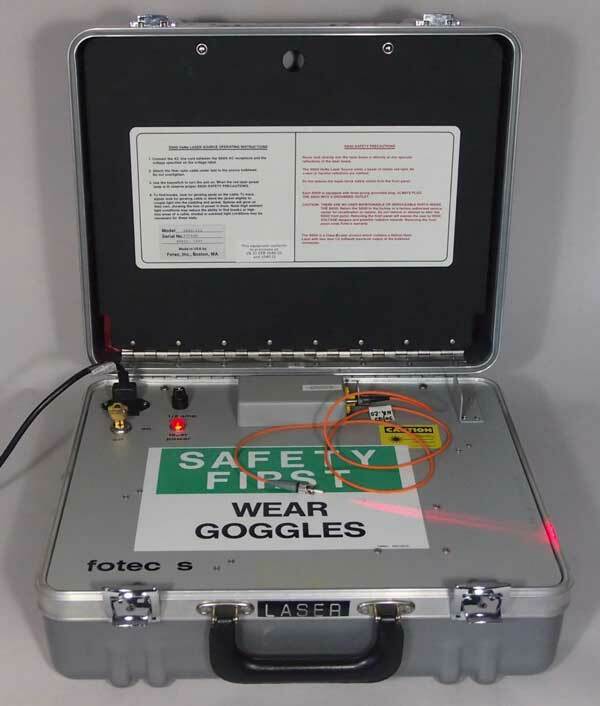 It was included in every FOTEC toolkit and sold as a standalone product. 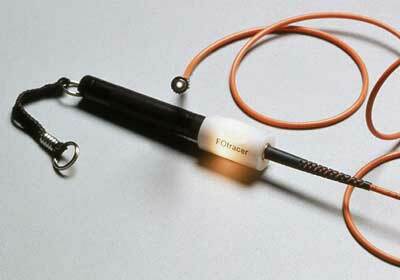 After FOTEC was acquired by FLUKE and closed, the design continued being manufactured and is still available today. 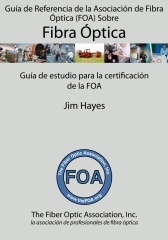 Jim Hayes, founder of FOTEC and editor of this newsletter. 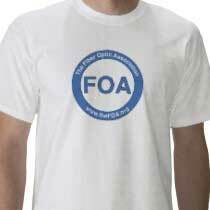 Survey: Do you like the occasional history we cover in the FOA Newsletter? Want to hear more? Want to contribute your stories? 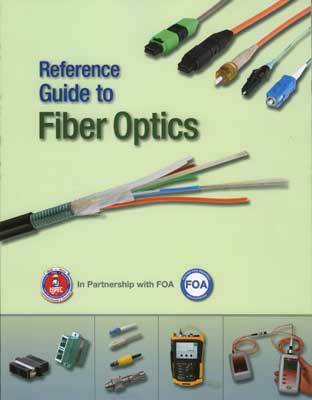 Do you know about early applications of fiber or special products? 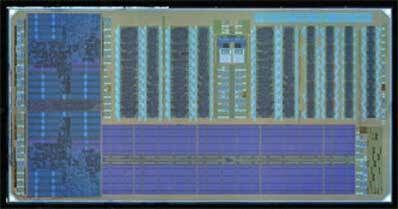 Researchers at UC Berkeley, UCo Boulder and MIT have created a single chip microprocessor that communicates with light. 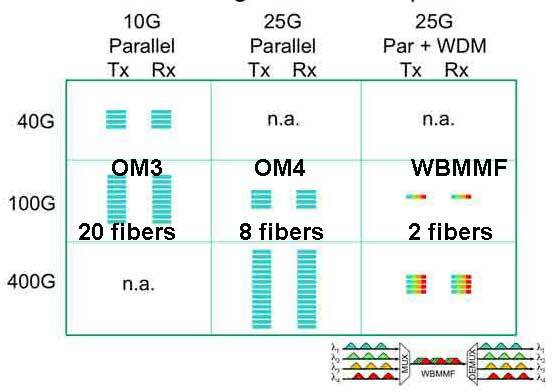 According to its developers, the chip marks the next step in the evolution of fiber optic communications technology by integrating into a microprocessor the photonic interconnects, or inputs and outputs (I/O), needed to talk to other chips. The photonic I/O on the chip is also energy-efficient, using only 1.3 W of power to transmit a terabit of data per second. 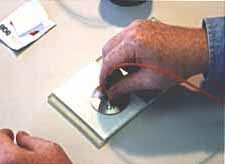 In the experiments, data was sent to a receiver 10 m away and back. 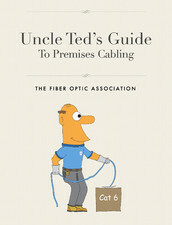 Where To Learn Legacy Telecom Cable Splicing? 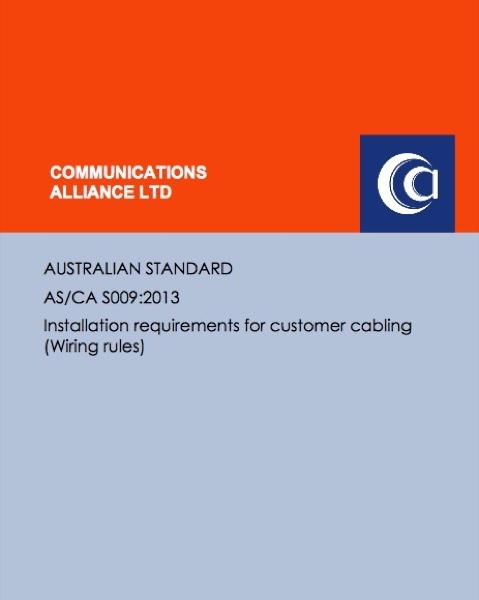 We were recently asked if there was some reference manual on splicing legacy telecom copper cabling. 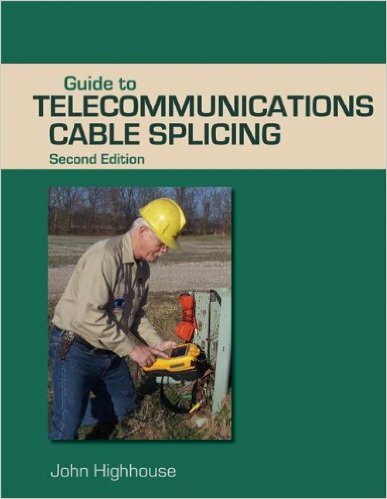 The only book we know is John Highhouse's Guide to Telecommunications Cable Splicing which is available on Amazon. That's John himself in the photo. John was a founder of the FOA while teaching at Lincoln Trail College. He served a term as FOA President in the late 1990s. 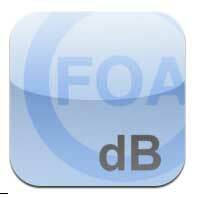 His major contribution to the FOA, beyond his technical expertise, was his background in teaching and test creation. 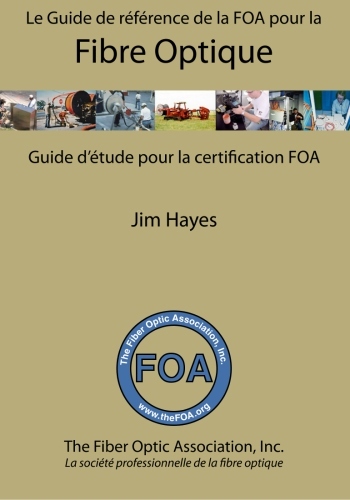 We credit John with teaching FOA how to create an integrated program of references, curriculum and tests that fairly assess the knowledge of the candidates for certification. 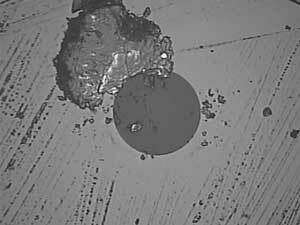 Not many people need to polish bare fibers, mostly those manufacturing fiber optic components like transceivers or switches, but when it's necessary, you need the right tools to do it. 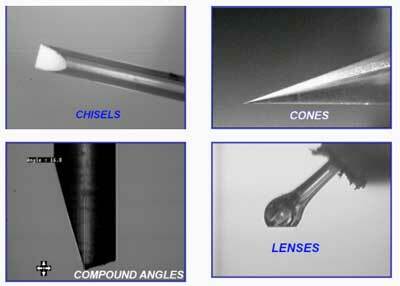 KrellTech has specialized in bare fiber polishing for over 20 years. 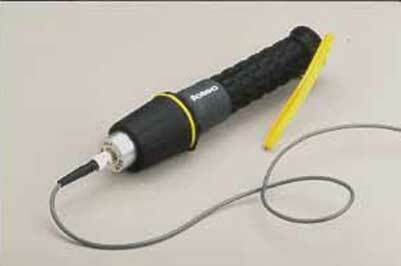 They are a supplier of equipment specifically designed for fiber processing. 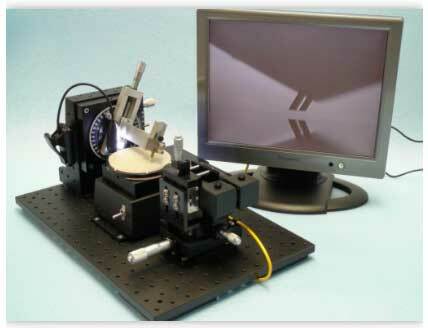 Both standard and custom systems are available for R&D projects to large scale manufacturing.